Angry Public Motor Vehicle (PMV) owners and drivers want the police hierarchy to put a stop to the alleged illegal police roadblocks along the Hiritano Highway in the Central province. 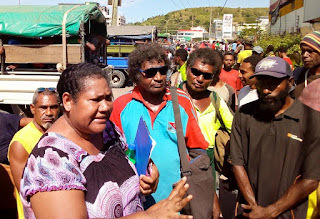 Mrs Josephine Salmang, one of the PMV owners said they are tired of the daily harassment by Central province police officers who usually demand upfront payment of fees for traffic offences rather than following the proper process of dealing with offences. “We are tired of the unnecessary fees charged for alleged overloading, the transportation of fuel containers, betel nut and other offences,” she said. “Most of the time, the officers use unmarked vehicles and sometimes they are not in uniform so it is difficult to know whether they are actual officers or not,” she further stated. Salmang added that this is also bad for business for the PMV owners because of accumulated cost of paying the unnecessary fees every week. It’s not only that; it is also affecting the locals that want to transport their goods to Port Moresby to sell in the markets. The Hiritano Highway is a national highway that serves the people of Central and Gulf provinces. PNGFM/ ONEPNG : Picture: PMV owner Josephine Salmang raising her concern during a gathering in Port Moresby yesterday.